There is nothing like crossing off something on your bucket list; especially when it has been in your bucket for a long time. 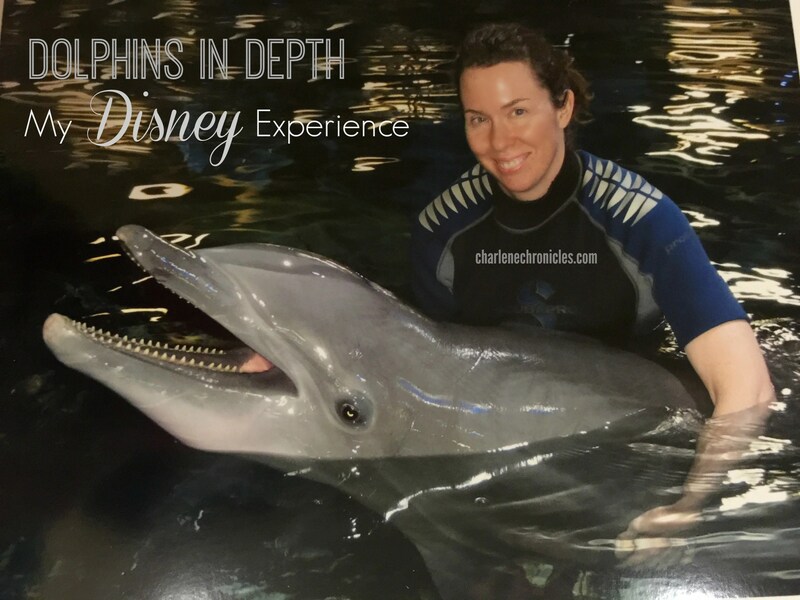 Yet, I got to enjoy the Dolphins in Depth experience at Epcot at the Walt Disney World Resort. It was something I had heard about for a long time and, with a love of Dolphins, it is something I’ve wanted to do for a long time. My Mom surprised me with the Disney Dolphin experience for my birthday and, even better, came along with me. We met at Guest Relations at Epcot first thing in the morning. (At the time of this post, they only have the experience in the mornings.) We made to sure to arrive at Epcot around 9am so we had plenty of time to park, take the tram and get through security. You don’t need Disney Park tickets for the experience, so we did not have to stand in the Epcot entrance line. However, you do have to pay for parking, so that is not included in the Dolphin Experience cost. Then we went on a tour where we learned about threats to dolphins, dolphin feeding, dolphins’ anatomy, and how the dolphins are trained. At one point, when we were getting some information, we looked over and one of the Dolphins had swum up and seemed to be checking us out! 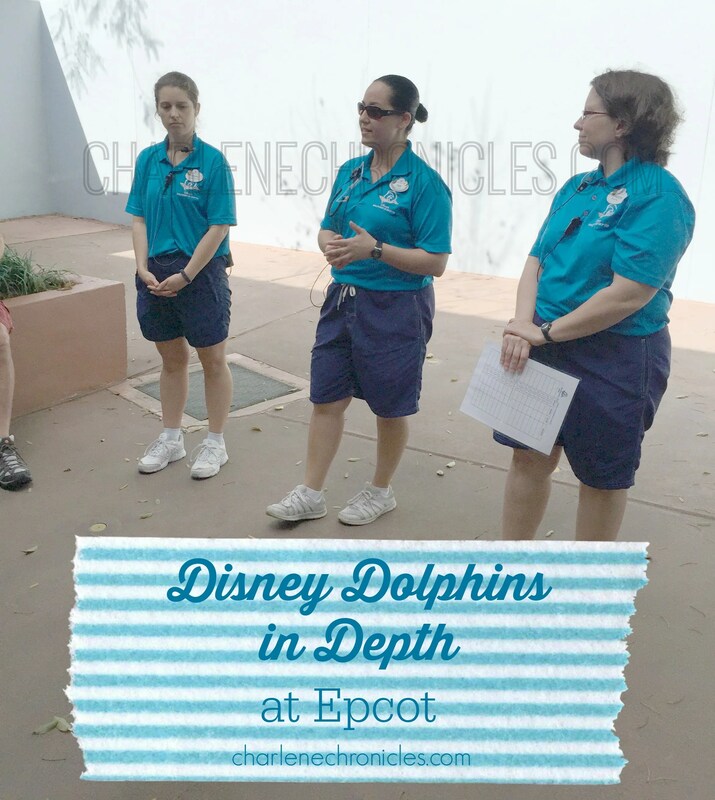 We then moved on and got front row seats for the dolphin education session within the Seas Pavilion with the rest of the Disney guest population. However, we wore headsets so we could hear the Disney Cast member in the crowds. During the education session, we got to see how the Dolphins are trained and how they learn, and why the session keeps the dolphins happy and healthy, and what we are learning from them. It was really fascinating. After that was over, we made our way back stage again, and had a quick coffee/water break. Then we were brought back to the locker room and pretty much went to get changed into our bathing suits (your own) and wetsuits/booties (they provided). If you have hair at or past your shoulders, you had to wear a fish safe hair tie that they provided. You also cannot wear any jewelry so best to leave it back at the resort, but otherwise, you had to leave it in your locker. You also could not bring your cameras for the Dolphin interaction. We met the trainers who were really patient in answering questions. The water was cold, but within two minutes, the wetsuit made it comfortable and, of course, being in the water with Dolphins was a distraction. From this point on in the post, it is going to be really hard to put into words the awe, the sheer joy and the amazing experience I had. We got to use hand signals, rub the dolphins and touch them, watch them in the water, then of course, take a photo giving them a dolphin hug. I can’t remember how much time we were in the water (had to take the watch off, remember?) but it was a good length of time. Then we headed back to the lockers to shower and change, get our photos and a little bag and pin, and headed out to enjoy the rest of our Disney Day. They did have shampoo, body wash, conditioner, towels, and hairdryers so no need to bring that stuff with you. We got out around 12:45pm so it was a solid 3-hour experience. You are brought outside the Epcot entrance so if you want to experience Epcot, you will have to have a separate ticket(s). The tickets for the Dolphins in Depth experience were about $200 per person and a lot of the funds, I think, go to support the Dolphins. While expensive, I think it is worth the experience and the support the funds give for the program. Sadly, not all dolphins are meant for the wild. These are rescued dolphins that are not able to be released back. I appreciate your views but please make sure you read up on their program and the work they are doing.